With the New York City Marathon coming up on November 5th, I though I would share the story of one of the winningest women in the cannons of the marathon and in life. Grete Waitz was a Norwegian schoolteacher who won more New York City Marathons — nine — than anyone else, and whose humility and athleticism made her a singularly graceful champion and a role model for young runners, especially women. In 1991, Runner’s World magazine named Waitz the female runner of the quarter-century, and she was perhaps the pre-eminent female distance runner in history. She twice set the world record at 3,000 meters, and she set world records at distances of 8 kilometers, 10 kilometers, 15 kilometers and 10 miles. But it was in the marathon, the 26.2-mile symbol of human endurance, that Waitz most distinguished herself, setting a world record of 2 hours 32 minutes 30 seconds the first time she ran one, in New York in 1978, and subsequently lowering the world standard three more times. 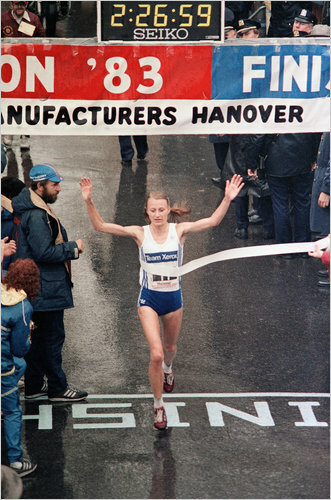 In addition to her New York City victories, Waitz won the London Marathon twice, the Stockholm Marathon once and the world championship marathon in 1983. Grete Waitz (whose name was pronounced GREH-tuh VITES) was not simply a champion, however; she was also something of a pioneer. At the time of her first New York victory, women’s distance running was a novelty. Just 938 out of 8,937 entrants in the 1978 New York marathon were women — in 2010, 16,253 of 45,350 entrants were — and the women’s marathon would not be added to the Olympics until the 1984 Summer Games in Los Angeles, where Waitz finished second to Joan Benoit Samuelson. “What will endure forever is that she was able to balance a competitive career with the most gracious lifestyle, and a character that emanated good will,” Samuelson said. Remarkably, Waitz, a champion track runner, ran her first marathon as a lark, with the encouragement of her husband, who was also her coach, and who told her that a trip to New York would be like a second honeymoon for them. Even in training she had never run more than 13 miles, and the science of the sport was young enough that her dinner the night before the race included shrimp cocktail and filet mignon, hardly the load of carbohydrates that even today’s rankest amateurs know to consume. As she recalled in later interviews, the last 10 miles of the race were agony, and she was so angry at her husband that when she crossed the finish line, she tore off her shoes and flung them at him. “I’ll never do this stupid thing again,” she yelled. She was, however, hooked. The next year, she finished the race in 2:27:33, beating her record by almost five minutes and becoming the first woman to officially run a marathon faster than two and a half hours. Her legendary status was assured. In her home country, her New York victories conferred on her the status of a national hero; a statue of her stands outside Bislett Stadium, an international sports arena in Oslo, and her likeness appeared on a Norwegian postage stamp. She established a 5-kilometer race in Oslo that eventually expanded to 40,000 runners, and in 2007, she started her foundation, which sponsors runners in major races and supports cancer hospitals and patient centers. But she was also lionized in this country, and especially in New York, and the image of her on the road — a quick, efficient stride, her pigtails slicing back and forth like metronomic windshield wipers — became familiar. She won her victories as the popularity of the New York marathon itself surged, and she became a celebrity in the city. Cabdrivers and the homeless called her by her first name, and over the years, she and her husband made appearances not only at the marathon but also at other New York events, including Grete’s Great Gallop, a half-marathon run each October as part of a Norwegian festival. Working with the New York Road Runners Foundation, she frequently spoke to the city’s schoolchildren, and she often appeared on behalf of Fred’s Team, the cancer charity started by her friend Fred Lebow, the founder of the New York marathon, who died of the disease in 1994. The information in this post first appeared in the The New York Times Obits. 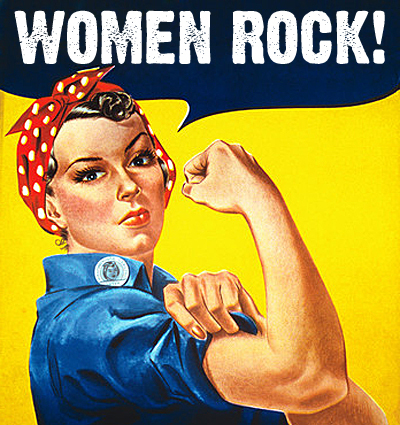 I invite you to share a link to your story of an inspiring woman. I live in the small town of Haddonfield, NJ. I am at an age in my life when I seem to spend time thinking and musing about life. These musings are usually stimulated by my walks through Haddonfield, my reading of books and fellow bloggers, and my interaction with my group of fabulous family and friends. Good luck to your son-in-law today. It is a beautiful day to run the marathon here on the East Coast. What an inspiring athlete. This proves that anything can be possible if we want it to. I remember her well! We were living back east (near NYC) in the early 80’s when she won so many of them. She was an inspiration! I remember watching her on tv winning the London Marathon. A class act, sad that she was taken from us so young. She is inspiring! It occurs to me that we can apply ourselves to many other things in life, that require such strength and single-mindedness. It’s a way of thinking and behaving that allows us to be heroes in our own lives. Thanks, Bernadette, this has given me a boost today! Alvin lives under my house but was looking to come in this morning.